Our plugin was deployed to the database, and we used ILMerge to package everything into a single DLL as required by CRM under this deployment type. This was not the cause of our problem. The strange thing is the plugin only error when running asynchronously. Changing the plugin step to be synchronous and everything works fine. It turns out that this is because there are different behaviours between the CRM execution context for synchronous versus that for asynchronous. The error occurs when this property is null. It is at this point that the _proxyTypesAssembly property is set for the IOrganizationService instance by the IOrganizationServiceFactory. 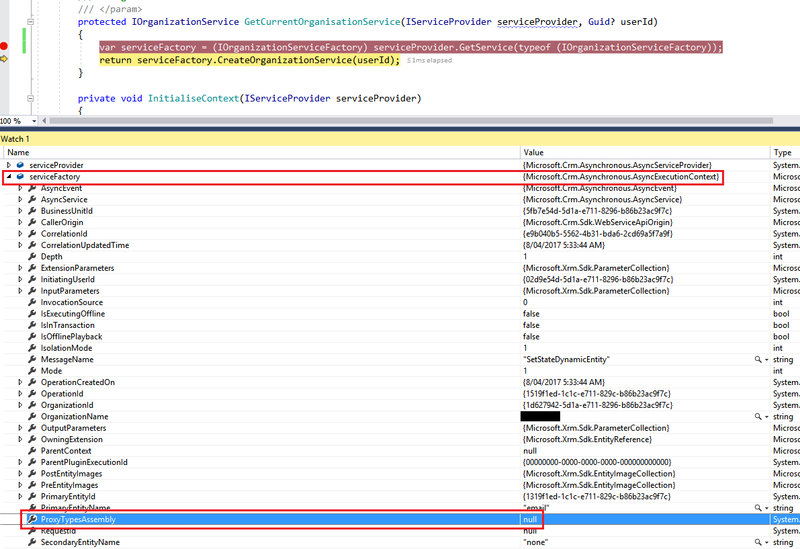 Below is a screenshot of inspecting the IOrganizationServiceFactory when the plugin in running synchronously. Note that the public ProxyTypesAssembly property is automatically set. 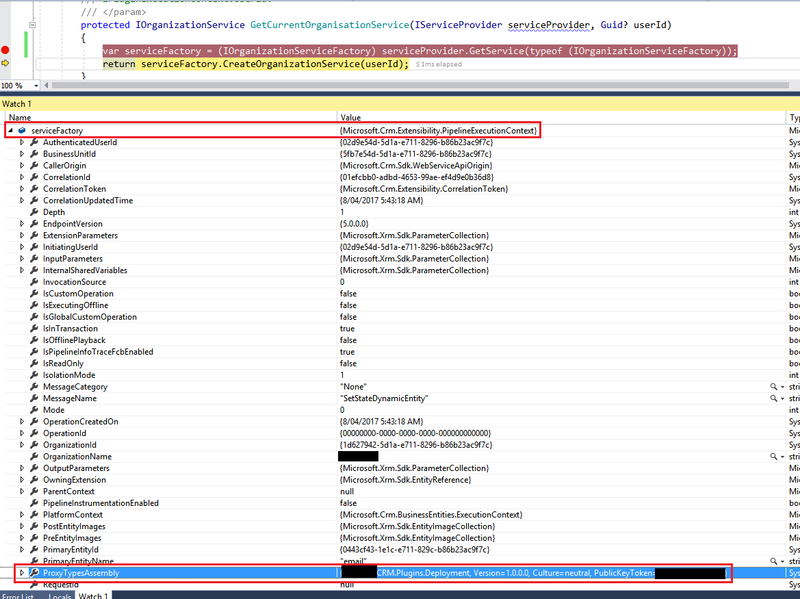 Also note that the type of the IOrganizationServiceFactory instance (serviceFactory) is Microsoft.Crm.Extensibility.PipelineExecutionContext. Below is a screenshot of the same plugin running asynchronously. Note that the public ProxyTypesAssembly property is null, and the type of the IOrganizationServiceFactory is different compare to when running synchronously. This is why by default plugins that use early-binding work fine in synchronous mode, but fail when running asynchronously. To fix this issue we need to set the ProxyTypesAssembly property of the IOrganizationServiceFactory instance. While this property is not exposed on this interface, Darko Micic has found that the IOrganizationServiceFactory interface can be casted to IProxyTypesAssemblyProvider, which allows us to set this property. Note that in Darko’s post he mentioned casting the execution context to IProxyTypesAssemblyProvider. 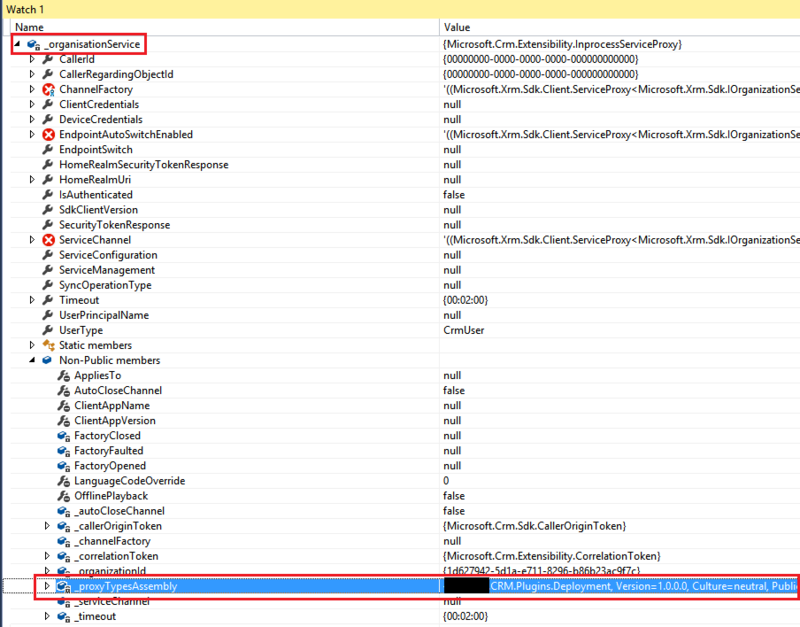 In my debugging I have found that IOrganizationServiceFactory and IPluginExecutionContext actually points to the same instance when retrieved from the service provider. I therefore have chosen to cast the IOrganizationServiceFactory instance instead. This entry was posted in CRM. Bookmark the permalink.